West Virginia (5-0) beat Texas Tech (3-3) 48-17 on Saturday. 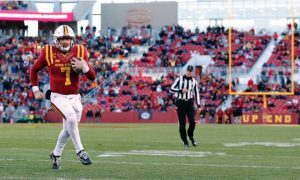 The Mountaineers were led by quarterback Skyler Howard who threw for 318 yards and a touchdown on 21-of-31 passing. He also ran for 89 yards and two touchdowns on 12 carries. Running back Rushel Shell ran for 104 yards and two touchdowns on 21 carries. Reciever Daikiel Shorts Jr. caught three passes for 100 yards and Jovon Durante had 83 yards on four receptions. 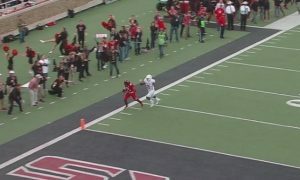 Texas Tech quarterback Patrick Mahomes threw for 305 yards and a touchdown and an interception on 28-of-44 passing. Reciever Jonathan Giles caught eight passes for 136 yards and two touchdowns.